Dogs have countless cute and adorable habits, but we have to be honest – drooling isn’t on the list. If your dog is slobbering all over the place and leaving a trail of saliva everywhere they go, there could be a reason for it. This guide will explain why dog’s drool, and whether you should be concerned about your pet’s inability to keep their mouth dry. 1 Why Do Dog’s Drool? 1.1 Is Doggy Drool Dangerous to Humans? 1.3 Do Dogs Drool Before They Attack? 1.4 Why is My Dog Slobbering So Much? 1.5 Why is My Dog Drooling on One Side of its Mouth? 1.6 Why is My Dog Drooling Around the New Puppy? 1.12 Can a Dog Ear Infection Cause Drooling? The first reason that a dog creates slobber is through their panting. While it’s a myth that dogs don’t sweat at all – they actually release a small amount of perspiration through their paw pads – panting is still the primary method for a canine to cool off. This will sometimes result in some dripping slobber! Another reason for drooling is that dogs tend to create a great deal of saliva in their mouths. It’s how they break down their food, as we covered in our guide to why your dog licks and chews their feet, it can also be soothing for them. Most of the time, a dog can keep this production of saliva under control and swallow it down – how much drool a dog produces depends on the breed. At times, however, they will produce excess saliva. Sometimes this is because your pet’s mouth is watering at the idea of the dinner that’s coming their way, and this drool is getting trapped in the dog’s mouth. This is then released in large quantities – and it’s nothing to worry about. Just keep a towel on hand! On other occasions, however, there may be some kind of medical reason for this excessive drooling. Perhaps your dog is creating an excessive amount of saliva in their glands that they are struggling to contain it, or they are struggling to swallow it down. In these instances, a vet should be consulted. Is Doggy Drool Dangerous to Humans? Thankfully, it’s just dog saliva. It may not the most aesthetically pleasing sight in the world, and you’ll want to dry yourself off if a dog drools all over your clothes, but there is nothing toxic to be found in canine saliva. Remember, some cultures even consider it to have healing properties. However, keep an eye on your dog. If they’re drooling more than usual, there may be a reason for it that requires investigation from a vet. It’s usually nothing to worry about, but sometimes excessive slobbering can be a warning sign from your pet that something is wrong. As you’ll see, there is a pattern that emerges. Dogs with flatter faces tend to drool more, primarily because the faces of these breeds contain skin flaps that trap saliva. One shake of the face later, and that drool is flying all over the place! This is less of a problem for a dog that looks more wolf-like is shape, with a long face or snout. If your Labrador, Alsatian or similar dog breed is showing signs of excessive drooling, it may be worthy of investigation. We’ll discuss some of the potential medical reasons for this below. Do Dogs Drool Before They Attack? Drooling by itself is not an act of aggression or a warning sign that a dog is preparing to bite another canine or a human. Drooling accompanied by aggressive behavior, however – especially when out of character for your dog – is a severe problem and should be investigated by a vet immediately. It could be a sign of a problem like canine distemper, or even rabies. Why is My Dog Slobbering So Much? If your dog is drooling more than usual or appears to be slobbering more than they ever have before all of a sudden, there may be a medical or psychological explanation. Heat Stroke. 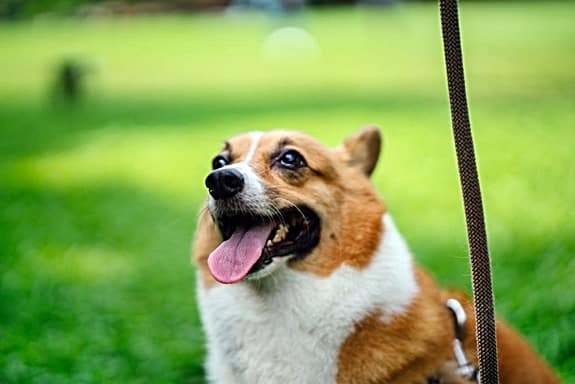 If your dog is running an excessively high body temperature, they may come down with heat stroke. Also known as heat exhaustion or hyperthermia, one of the symptoms of this highly dangerous condition is a substantial amount of drooling. 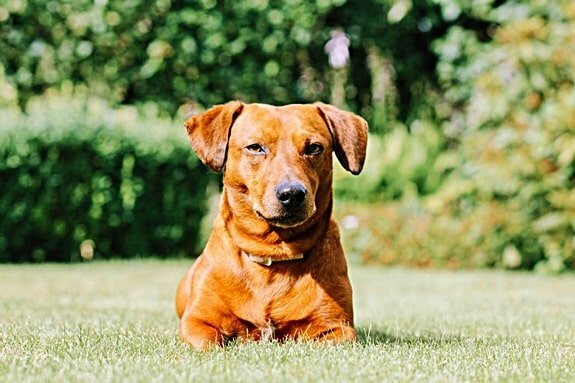 Seek help from a vet ASAP if you suspect that your dog is suffering from heatstroke, but also check out our guide on what you must do you if your dog is dehydrated. Irritation. One of the most common reasons why a dog will start to slobber – seemingly out of nowhere – is an irritation in their mouth. 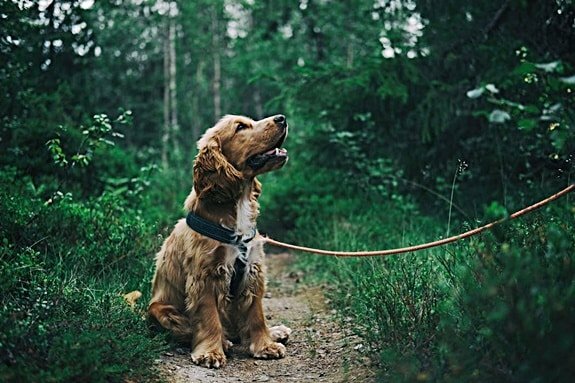 This may have been caused by your dog chewing on something they shouldn’t, such as a stinging nettle or electrical cable or tin foil. If you suspect that irritation is to blame for your dog’s slobbering and the drooling lasts beyond a few hours, see a vet. Poor Oral Hygiene. This could be gum disease or another health condition that impacts negatively upon your dog, or maybe they have a toothache or something similar. Dogs tend not to be shy about letting us know if they’re suffering in such a way, so be vigilant about understanding the symptoms (most notably refusing to eat) and seek professional help from a vet. Teething. A teething puppy will drool a lot more than an adult canine equivalent, so don’t panic if your pup is leaving a trail of slobber in their wake. There is every chance they will get their watery mouth under control by the time they reach adulthood! Irritation. One of the most common reasons why a dog will start to slobber – seemingly out of nowhere – is irritation in their mouth. This could be gum disease or another health condition that impacts negatively upon your dog, or maybe they have a toothache or something similar. Dogs tend not to be shy about letting us know if they’re suffering in such a way, so be vigilant about understanding the symptoms (most notably refusing to eat) and seek professional help from a vet. A sore Throat. Your dog may be expelling a considerable amount of saliva because they are reluctant to swallow anything they are producing. This may be something comparatively mild that can be treated by antibiotics (unless it’s a result of kennel cough, in which case it will just have to run its course), but it’s worth getting a vet to give your dog a once over. Blocked Throat. If your dog’s throat is blocked, it’s something more serious. Maybe your pet swallowed something that got stuck in their windpipe, or it could be down to a medical condition called megaesophagus. This can be hugely dangerous and prevent your dog from breathing, so you should rush your dog to a vet if they appear to be struggling to swallow. Travel Sickness. We’ll discuss this in more detail shortly, but drooling and slobbering are telltale signs of pet travel sickness or motion sickness. You may find that your dog slobbers more while riding in the back seat of a car, or just before their ears popping when taking off on a flight. Anxiety. Sometimes, however, a dog may drool a little more when they’re feeling unsettled or nervous. If you find that your dog tends to slobber up a storm while they’re in the waiting room of the vet or when they meet a new person for the first time, their nerves could be the explanation. Of course, it bears repeating – dogs will produce drool, so unless it’s sudden and to excess, try not to worry too much. Just a general mouthwatering isn’t always worthy of rushing to the vet, but it’s better to be safe than sorry. Why is My Dog Drooling on One Side of its Mouth? If your dog appears to be continually drooling from just one side of his or her mouth like some kind of canine Sylvester Stallone, there could be many possible explanations. Check your dog’s mouth to ensure that there is not a foreign object lodged in their cheek that is causing everything to run to one side of their mouth. Dogs tend to swallow a great many strange things from the floor, so they may have wire causing an issue, or they may even have a stick of some kind in there. Check your dog’s mouth for any sign of ulcers, gum inflammation or some other kind of oral or dental distress. Keeping an eye on your dog’s gnashers is hugely important – check our guide on how to brush a dog’s teeth if you need advice on this score! Also see a vet if you suspect a problem within your dog’s mouth, as there could be a bacterial infection to deal with that requires medication. If none of these explanations seem to carry any weight for you, make an appointment with your vet. It’s possible that your dog has some kind of health condition that is leading to them slobbering from one side of their mouth, and this is worth looking into. Why is My Dog Drooling Around the New Puppy? If you have introduced a new puppy to your home and your existing dog is drooling in their presence, it can be a little frightening at first. Don’t panic; your faithful canine isn’t sizing up this new arrival as a potential meal and struggling to prevent their mouth from watering. They are, however, somewhat stressed by the fact that they’re suddenly sharing their space, and this drool is a result. This drool may be the warning sign of a panic attack, so separate the dogs as quickly as possible. You should keep an eye on this. In theory, following the slow and steady integration of the two canines, it’ll pass pretty quickly, and you’ll find that your older dog will soon return to normal. If this is not the case, seek help from a vet or animal behaviorist. 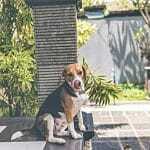 ‘Strange’ is a subjective term when it comes to doggy behavior, and you’ll know better than anybody else if your pooch is acting out of sorts. Any strange conduct should be reported to a vet in case it’s a sign of ill health – if drooling accompanies these odd actions and you can’t pinpoint any potential reasons why you should speak to an expert. This is most likely a sign that your dog is in pain in some way – most likely as a result of dental drama that is giving them a sore mouth. As we cover in our guide to why a dog licks everything in sight, they are trying to soothe themselves in some way. The slobbering and drooling in advance of this may be because they are suffering from an oral issue. There is also a chance that your dog is hugely nervous and apprehensive, especially if they are licking the thin air. Take a look at your dog’s tail in such a situation and learn what position it means. 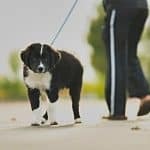 A dog’s tail between its legs doesn’t always mean it’s sick – your dog may just be trying to tell you that they are frightened, and would appreciate being removed from a situation. Vomit is never a good sign with a dog, and accompanying the sickness with slobber doesn’t make it any better – though drool quite often precedes an unwelcome emptying of the stomach. If your dog is producing a huge amount of drool and throwing up, it more than likely means that they have placed something in their mouths that are irritating them in some way – either in the form of an allergy, or it’s something toxic. 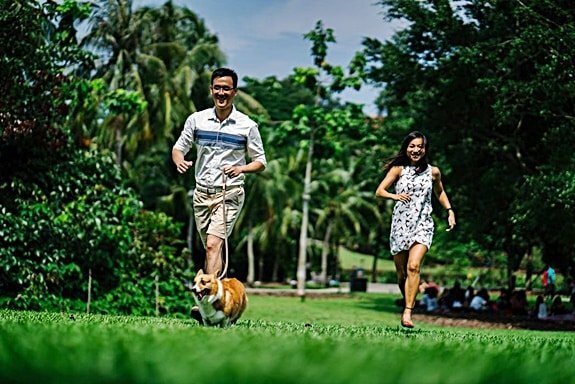 Plants are arguably the most likely culprits in this instance, so if you’re wondering why your dog is eating grass all of a sudden, you may be able to track down the answer to their oral irritation. You may also find that your dog is retching a kind of white foam that closely resembles the drool and slobber that appears at the corners of their mouth. This is usually because their stomachs are empty, and they are unsuccessfully attempting to purge something that is irritating them. It isn’t necessarily a reason to dash straight to the vet, but this is certainly something to keep one eye on. A dog doesn’t tend to shiver or shake unless there is something very wrong, or they are very, very afraid. Either way, it’s not something that you’re going to want to ignore. 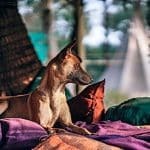 Remove your dog from a situation and offer reassurance if you suspect they are having an anxiety attack, and get them to a vet if you can’t explain why they are having such a reaction. Forget the drool – shivering and shaking is usually a symptom of a significant organ problem within your canine’s little body, potentially impacting upon the kidneys or the heart, or the initial signs of a seizure of some kind. They’ll need to be checked out before it has the potential to get any worse, and time will be of the essence. We hate to break it to you, but so do you. Yep, we all like to imagine that we lay in perfect serenity like Sleeping Beauty, but humans and canines alike are prone to leaking drool from the corner of our mouths while we’re snoozing. That’s because we are not consciously swallowing the saliva that our mouths continue to produce regardless of whether we’re awake or asleep, and we may also take up an unfamiliar position such as laying upon our backs. On top of this, our muscles are all hugely relaxed, and we’re not consciously preventing drool and slobber from creeping out of the corners of our mouths. Unless your pet is drooling to an excessive point that wakes them up or leaves them at risk of choking, let sleeping dogs lie. You’ll have to do a little mopping up afterward, but there’s nothing dangerous about it. Can a Dog Ear Infection Cause Drooling? Yes, very much so – drooling and slobbering are closely linked to a dog’s ear health. If your dog’s ear smells and has brown discharge, it’s vital that this is seen to as quickly as possible. It’s not usually a significant problem that will be difficult to treat, but your dog will be in discomfort until you get around to doing so. It’s not just ear infections, either – problems with the eyes and throat can also lead to an excess of drool in your canine. Any of these ailments will be typically resolved by a course of antibiotics that are prescribed by a vet, so they’re not necessarily something to worry about. It’s just a matter of being vigilant and ensuring that you take the necessary action as early as possible. Vestibiluar Disease – all the symptoms of vestibular disease are very similar to that of a stroke, but thankfully it’s usually something considerably less severe such as an inner ear infection. Your dog will still need to be seen by a vet ASAP, however. 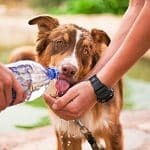 Water Intoxication – if your dog has been swimming of playing with a hose all day, there is a slim chance that they have consumed more water than their little bodies can handle. This could lead to their lungs becoming flooded, and they’ll drool to excess and stagger around as though drunk. Get medical help ASAP if you suspect that your dog has water intoxication. Gastric Torsion – another very serious health condition that tends to feature these symptoms is gastric torsion, which will need to be investigated by a vet urgently as it can quickly become fatal. 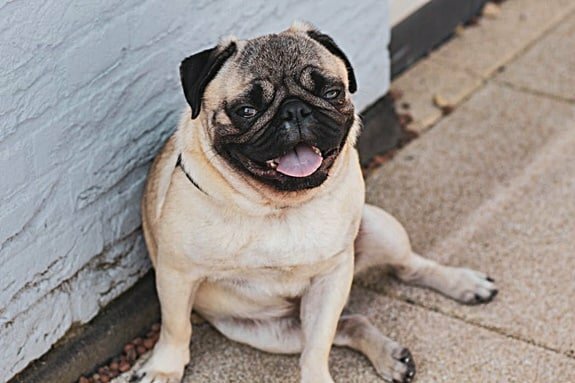 You will learn more about this condition in our guide to what you can give your dog for gas and bloating. Although we’ve been at pains throughout this guide to point out that drooling isn’t usually a concern, it can be worrying if accompanied by a loss of mobility and coordination. Don’t take any chances if your pet is exhibiting any of these signs. Drooling and slobbering in the car is a hugely common thing, primarily because it’s a popular side effect of travel sickness in pets. This is because a dog’s sensitive ears will vibrate and react to the movement of the car, and this could leave them feeling a little vulnerable. If your dog doesn’t enjoy car travel and it makes them nervous, they are even more likely to drool and slobber as their anxiety gets the better of them. Thankfully there are many different medications that can reduce the chances of this drooling, as will opening a few windows to take Fido’s mind off the fact that they’re being transported in a steel box. Drooling is a fact of life for most dogs, especially if you have a particularly flat-faced breed, and for the most part, it’s not a cause for concern. Never take a chance where your pet’s health is concerned though; if your dog is starting to drool uncharacteristically, cross-check all the potential reasons above and get them checked out. If nothing else, you’ll save yourself a whole lot of laundry.